Wish you all a very Happy Ugadi!!! Three each day, seven days a week Ruddy apple, ruddy cheek. My cousin Lakshman “the coolest” was the inspiration/force for me behind making this delicious apple pie. For Diwali we went to “Big Apple” to my uncle’s place, as usual the house was flooded with guests (few of them are visiting US for the first time). After having yummy meal including desert we were totally stuffed and uncle told us that there are lots of apples which need to consumed, though there were people to eat, but consuming two dozen apples after a heavy meal is not an easy task. So I casually told my cousin that we can bake apple pie and it’s the easiest way to clean up before they are spoiled. At this point I had no clue how to make an apple pie as I never made it in my life before. Apple pie is one of his favorites he wanted to start immediately. 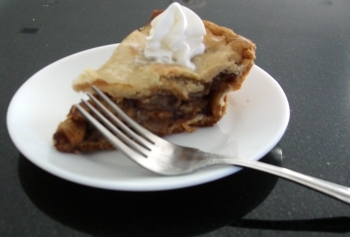 I was not really confident to make everything from scratch; I got an idea of making pie’s using ready made crusts. I went and googled for the recipe and found a very simple one from epicurious.com. I made few modifications to the original recipe to suit our taste. For Thanksgiving my cousin baked another batch and he sent me the pictures. Thanks for the pictures Lakshman!!. Ok let’s jump to the recipe. Mix sugar with flour; cut in butter until crumbly. Make the crumble once you fill the pie crust with apple mix. Preheat oven to 350°F. Combine apple juice, sugar, and butter in a bowl. Add apples and cornstarch. Place one piecrust in a 9″ pie pan and fill with mixture. Now sprinkle the crumble mixture over the apples. Roll out top crust and cover pie, sealing carefully, cut steam vents or you can slice the pie-top into eight 1/2-inch-thick strips and drape over filled pie shell in a crisscross pattern; pinch edges to fasten to bottom crust. 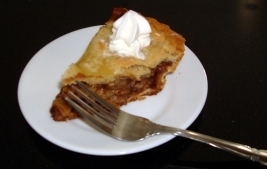 To prepare topping, lightly brush pie-top of with milk; sprinkle cinnamon sugar evenly over dough. 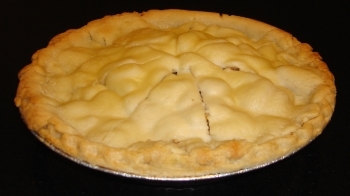 Place pie plate on a foil-lined baking sheet; bake 55 minutes until the crust is browned and apples soft. Cool down and serve with whipping cream or vanilla ice-cream. To avoid apples from browning add ½ tsp lemon juice. Always use cold butter to make crumbles soft butter will turn the mixture into dough and always make this at the end. You can add vanilla essence and lemon zest for extra flavor. It is Halloween time and it’s still warm here in East Coast, which makes me crave for cool treats. Ice cream is the first thing that comes into my mind. I had a left over watermelon lying in the fridge. None of us wanted to eat or drink the juice anymore. Then a thought came across – Granita. A very easy and delicious icy treat made with fresh fruit. Granita is a popular Italian dessert. It is semi-frozen treat made with water, sugar, lemon juice and flavorings which can be made pretty much with anything sweet and any kind of liquid right from juices ( fresh or canned) to fruit puree’s and even with Italian sodas and doesn’t need any special equipment to prepare. For me it’s the best treat available anytime and all year round. In a small saucepan, combine the sugar with water and bring to a boil over high heat, stirring, until the sugar dissolves. Allow this sugar syrup to cool down to room temperature. 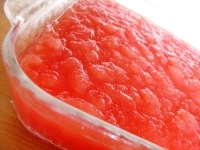 Puree watermelon cubes along with lemon juice until smooth. Strain the mixture into a large bowl through a coarse strainer, using a wooden spoon to push the puree through. Combine the sugar syrup and this puree. Pour into a chilled tray and place this tray in the freezer. Scrape the mixture every 30 minutes with a fork, Make sure to scrape evenly. Repeat the process and continue to freeze and break up ice crystals until completely frozen, about 3-4 hours. 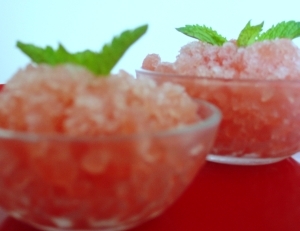 Spoon the granita into tall glasses or bowls and garnish with the mint leaves. The granita can be frozen for up to a week. Stir & scrape with fork before serving. You can use all kinds of fruits both fresh and frozen for this treat. 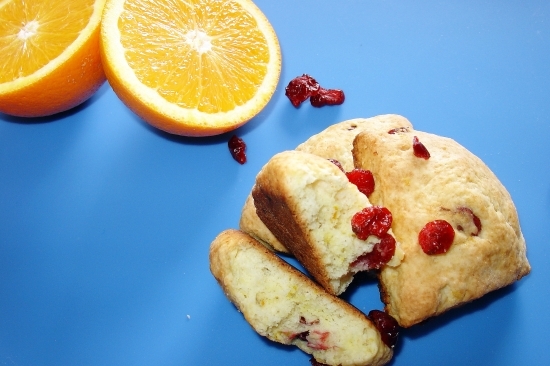 An English scone resembles a cake but is little more firm than a cake. It has a firm crust and is flaky inside. 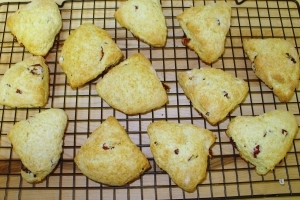 A perfect snack with evening tea, Scones are very similar to the American biscuit. Common ingredients used are flour, sugar, baking powder/soda, milk (or buttermilk or yogurt or heavy cream), and eggs. I picked up this combination of oranges and cranberries from a food network show. They were using these in preparing biscotti. I thought this would be a great combination for any bread related recipe and experimented with scones. Mix the dry ingredients together in a medium bowl. Cut in the butter until the mixture resembles course crumbs. Stir in the egg/egg replacer mixture. Add orange zest, juice and dries cranberries. 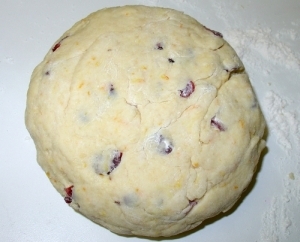 Gradually add the milk until a thick dough is formed. (It may take more or less than 3/4 cup). Turn out the mixture onto a surface dusted with flour and knead lightly. 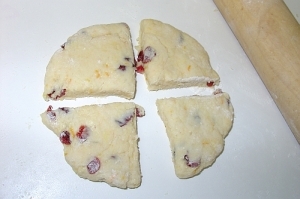 Roll out the dough to 3/4″ thickness and cut into rounds with a 2″ cookie cutter. Gather the trimmings and lightly knead, roll, and cut them as well. Place the rounds about 1″ apart on a lightly greased baking sheet. Brush the tops with a little milk. Bake in a preheated 450° oven for about 10 to 15 minutes, until golden brown. Serve warm. To store, cool them down to the room temperature and store them in an air tight container. They would last for a week. You can use egg instead of egg replacer. You can also use 2% milk or butter milk instead of whole milk. Add little extra sugar (around 1 tbsp or according to your taste).This recipe makes 12 to 16 scones, depending on the size you make. You can even eat for breakfast. The best part is these scones are eggless. If you are using egg replacer, stir the milk slowly and little at a time to get the desired consistency. Other wise the dough will become runny. As orange is AFAM for this month, I thought this will make a perfect entry created by Mahi and organized by lovely Sharmi. I used Eger-G Egg Replacer, I bought it from Whole food market and its also available in local GNC stores. Lakshmi told me about this. Thanks Lakshmi!!! I love pineapple in all forms. Few of my favorite are fresh pineapple juice, pineapple fried rice and on Pizza. Haggin-das has pineapple coconut ice cream flavor I use to eat like crazy but now i got bored so for a while i’m taking break from that. First time when I had pineapple on pizza, I was really surprised with the taste and it just blended so well with other vegetables. Now salsa is added to the list. 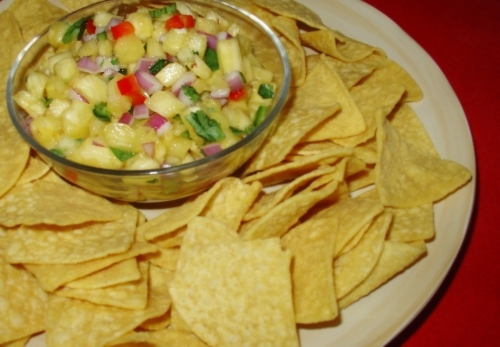 Pineapple salsa is a spicy, sweet, colorful, and delicious – this is a versatile tropical salsa that goes well with any type of meal.Cumin adds smokiness to the dish and gives a unique flavor.I love to eat this with chips and also as a side dish with my Mexican favorites. 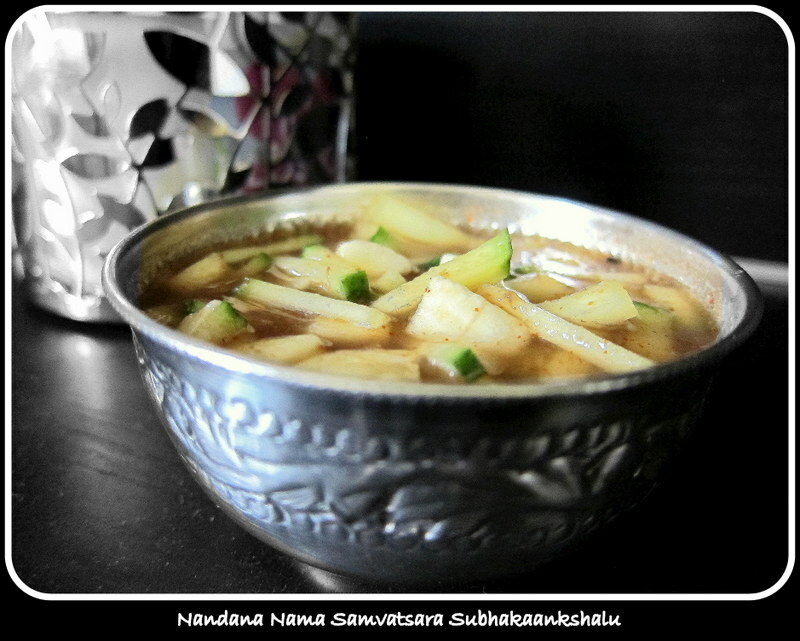 This is a super easy recipe and is really great dish (summer) or anytime, also has a nice fresh taste. You can also serve this along with greens; the possibilities with this wonderful tropical fruit are endless. It not only a treat to eyes and mouth but also a crowd pleasing dish. I served this with regular store bough tortilla chips and it’s really tasted delicious and everyone loved it. This is my entry for Mahi’s AFAM. 2-3 tbsp finely chopped coriander leaves. In a large bowl, toss together pineapple, red bell pepper, onions, jalapeño pepper, lime juice and cilantro. Season with cumin and salt. Cover, and chill in the refrigerator until serving. You can use canned pineapple but drain all the juices and then use for making salsa. You can even grill the pineapple for extra flavor. If you don’t like cilantro you can use mint. Some times fresh pineapple may cause irritation of the tip of the tongue in some cases, so take a small bite and if u feel irritation, take a big bowl of water add little salt and drop the pineapple slices in salted water for 1-2 minutes, rinse with fresh water pat to dry and chop. My mom always does this. It really works. So sometimes even I do this. The pineapple (Ananas comosus) is a tropical plant and fruit (berry), probably native to Brazil or Paraguay. Pineapples have excellent juiciness and a vibrant tropical flavor that balances the taste of sweet and tart. Pineapples are a composite of many flowers whose individual fruit-lets fuse together around a central core. Each fruit-let can be identified by an “eye,” the rough spiny marking on the pineapple’s surface. Pineapples are wide, cylindrical in shape, a scaly green, brown or yellow skin and a regal crown of spiky, blue-green leaves and fibrous yellow flesh. Pineapple is a good source of manganese, thaimin (Vitamin B1) as well as containing significant amounts of Vitamin C and Vitamin B1, also pineapple contains a proteolytic enzyme bromelain, which digests food by breaking down protein. Pineapple is commonly used in desserts and other types of fruit dishes, or served on its own. The pineapple juice has been fermented into an alcoholic beverage commonly called pineapple wine, which is a type of fruit wine, most commonly produced in Hawaii. Pineapples are also used as topping for pizza, most commonly in the “Hawaiian” type pizza . Pineapple juice can thus be used as a marinade. Although the season for pineapple runs from March through June, they are available year-round in local markets. It will not ripen once harvested, so must be harvested ripe and brought to the consumer without delay. Pineapple is therefore most widely available canned. Pineapples are second only to bananas as America’s favorite tropical fruit.